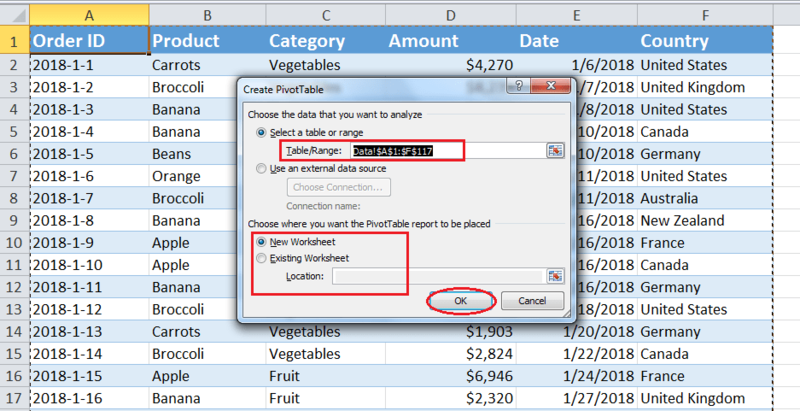 Pivot tables in Excel are a tool used to analyze big data sets. This tool summarizes big data sets in a user-friendly, easy to understand and meaningful report. 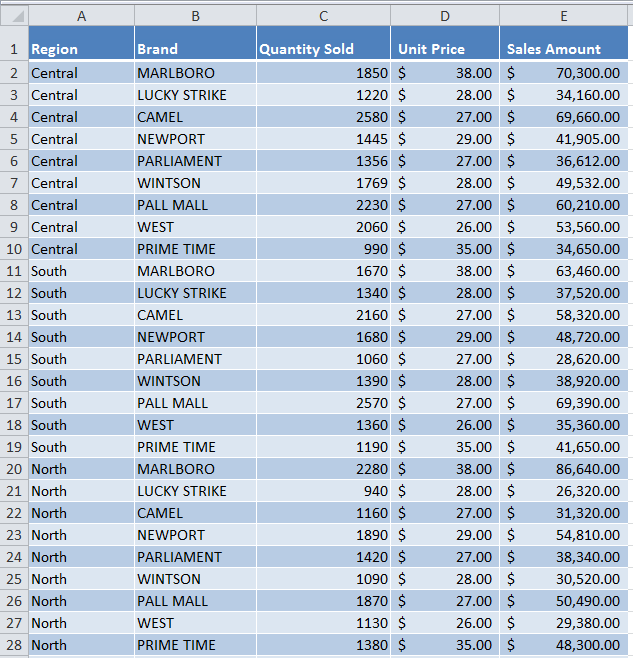 In this article, you will learn how to create a Pivot table in Excel. A pivot table allows you to look at your data in a different way. You can explore your data and create a different look and feel about your data to make quick business decisions. You don’t need to apply difficult formulas to analyze your data, as it is just some click away to summarize and create reports. Before you create a Pivot table in Excel, it is important to format your data correctly, otherwise, it will not generate correct results. Each data type should be laid out in a separate column having a header on top, called a data field. Each data field should be formatted as text, number or date as per type of data it contains. There should be no merged cells in data fields. Let’s assume you are working in a company that deals in exporting fruits and vegetables to different countries. You have a data set of orders that have been processed to various countries date wise, and you want to explore your data set to see which product categories are best-selling in various countries. 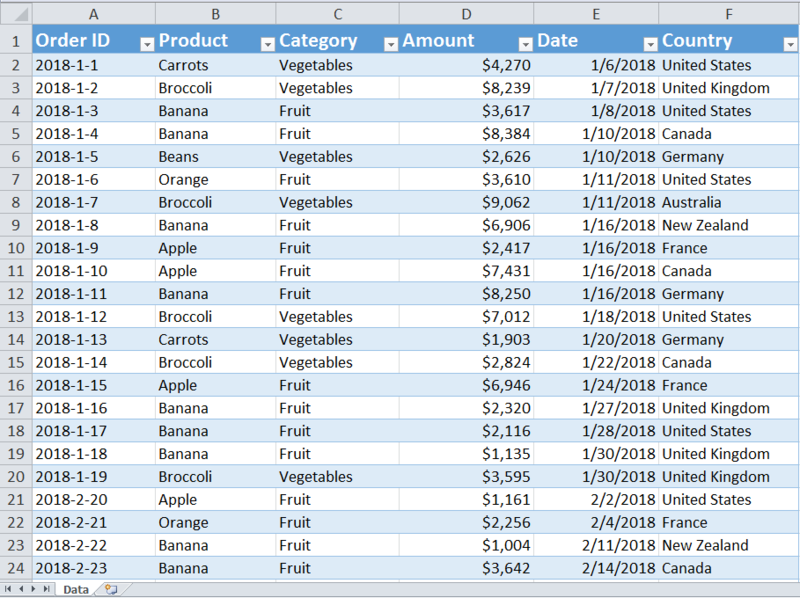 A pivot table allows you to split, filter, and group your data as per product categories, countries, and dates. This dataset contains 6 data fields as shown below. The following dialog box appears. Excel automatically selects your data set and by default creates a New Worksheet where you want the Pivot table report to be placed. Alternately, you can select Existing Worksheet and location where you want the Pivot table report to be placed. Press OK.
After inserting a Pivot Table, Excel generates the Report View pane on the left side and lists all the data fields in Pivot Table Field List panel on right side. You need to pick and drag data fields from Field List panel and place them in Row Labels, Column Labels, Filter and Values areas to generate their report view on the left-hand side. You can create single dimensional or two-dimensional Pivot tables by placing data field in their respective Labels as per your requirement. Number fields are placed in Values area to make a calculation, and other data fields are placed in Row, Column and Filter areas of Pivot Table Fields list panel as per requirement. A single dimensional Pivot table summarizes dataset either in Row layout or Column layout for the selected data fields. For example, if you want to see the summarized report of all products only, then it is called a single dimensional Pivot table. In order to do that, you need to drag and place Product field either in Row or Column Label area and place Amount field in Values area to sum their respective order amounts. This summarizes the sales amounts of all the products in the data set. Two-dimensional Pivot tables are created by dragging and placing data fields in Rows and Columns areas. It further splits the data and gives more insight into data by generating a different view of data. You can filter Pivot table results by placing the data field in Report Filter area, on the basis of which you want to narrow down your results by applying filters. For example, you want to filter results based on product category, so you can place Category field in Report Filter area and narrow down the results by selecting one category from the list. Suppose you want to summarize products related to Fruit category only. In Excel, Pivot table by default summarizes numeric field results by applying SUM. 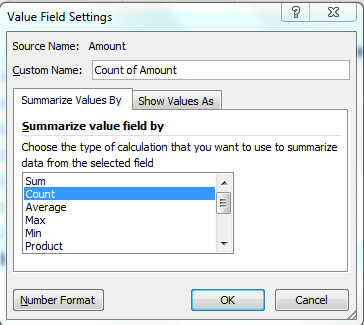 But, you can change that by changing the Field Value Settings of Value area field. For example, instead of SUM, you can change the result by COUNT, Percentage, or Average, etc. Suppose you want to count how many orders have been placed in each country for each product. In order to do that, just click on the drop-down list of Amount field in Value area, and click on “Value Field Settings…”. 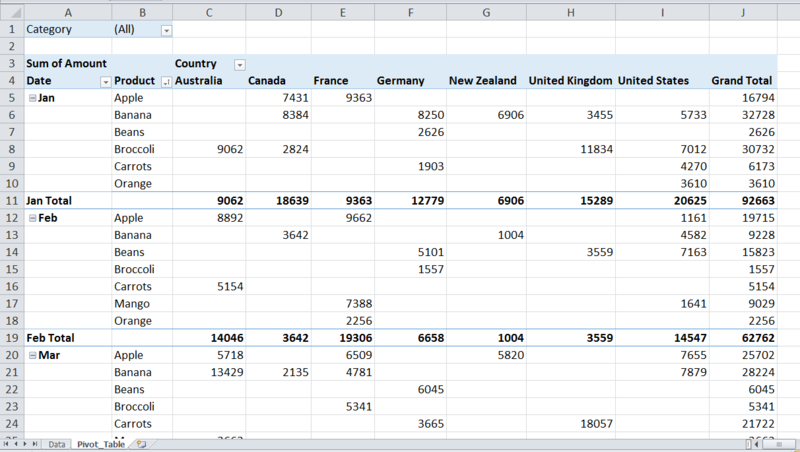 The Report View pane will show a count of values in each country for each product, instead of the sum of values. In Excel, Pivot table by default shows values as “No Calculation.” But, you can change that by changing the Field Value Settings on “Show Value As” tab of Value area field. For example, you can show the values as % of Row, % of Column or % of Grand Total, etc. 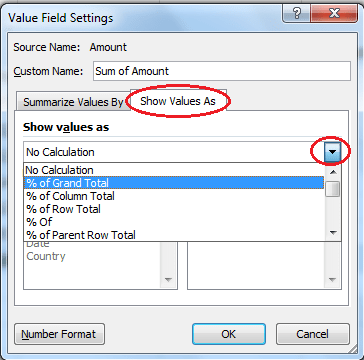 In order to do that, just click on the drop-down list of Amount field in Value area, and click on “Value Field Settings…”. You can see Pivot table has changed the output as % of Grand Total values of each product and for each country. In this way, you can check the contribution of each product in total revenue country wise. 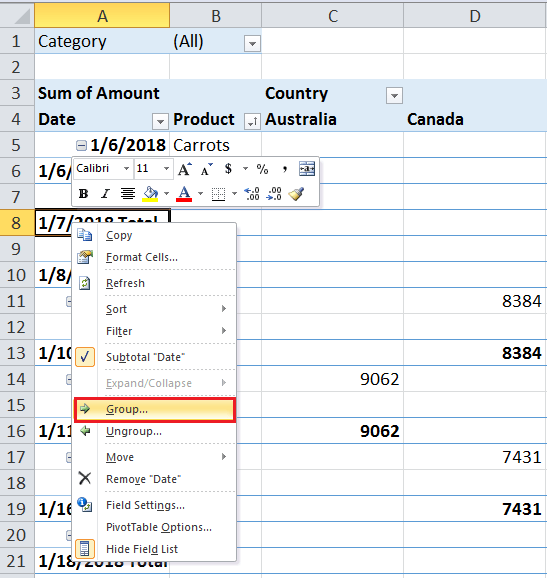 In Excel, Pivot table by fault sorts the fields’ results placed in Row and Column areas in ascending order and places their summarized values accordingly. 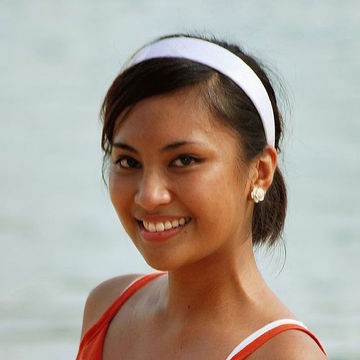 But you can change this order and sort any of the fields as per your own requirement. For example, you can sort the product from ascending to descending order. 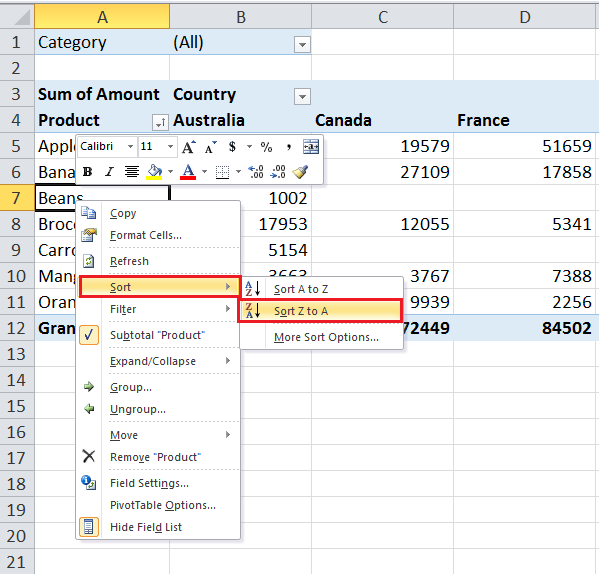 Right-click any cell inside the Pivot table and click on Sort and select the desired order. In the same way, you can sort the results on the basis of Grand Total values from Largest to Smallest. The pivot table can group the fields’ data in report view as per data type and user requirements. For example, you can group the date and time fields in hours, minutes, days, months, quarters, years. It is recommended to place such fields in the Row area, right-click in any cell of that field inside the pivot table, click on Group and click on the desired grouping item. For example, you can group the Date field in Months and summarize the Pivot table data as per months for product sold. 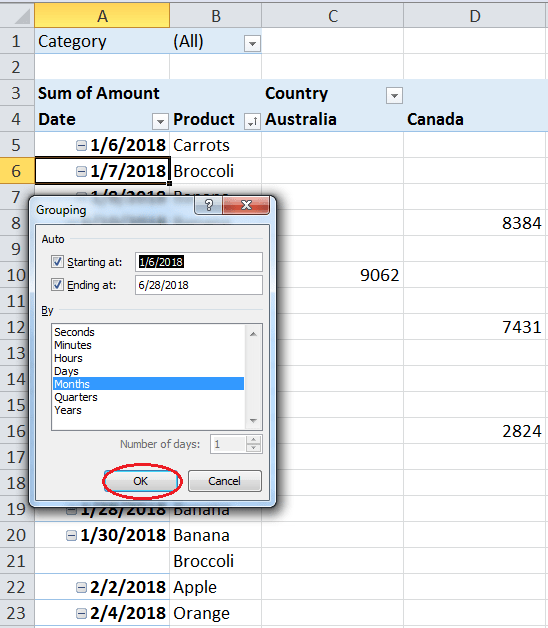 Here, you need to place Date field in the Row area, and then place Product field under Date field in Row area. Go to Pivot table; right-click in any cell of the Date field in Pivot table, click on Group, select Months and click on OK.
Hello, I create a database in an excel tab and created a pivot table in a different tab, but when I update the database it doesn't automatically update the pivot table. Cant create pivot table in excel.